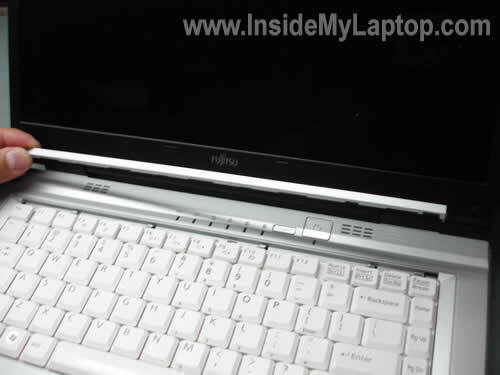 This guide will help you take apart a Fujitsu LifeBook V series notebook. 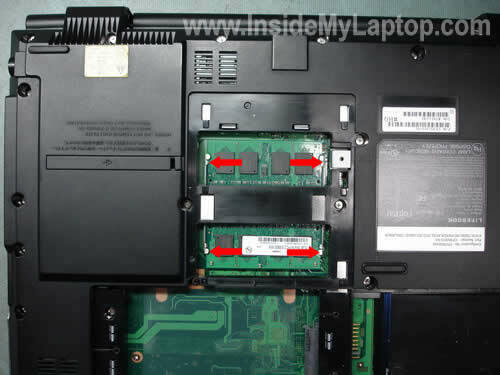 It will show how you can remove the hard drive, memory modules, DVD drive and keyboard. Also, I’ll show how you can clean up the heat sink. 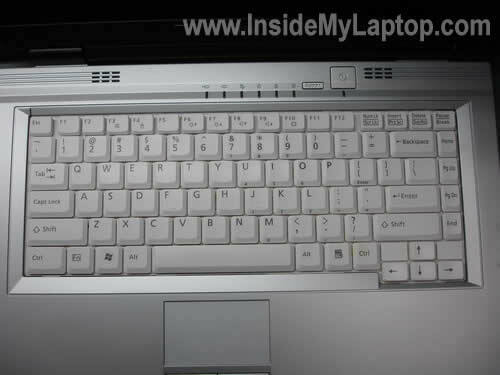 I have created this guide while taking apart a Fujitsu LifeBook V1010. The badge on the front said “LIFEBOOK V Series” so I assume this guide should work for other modes in the LifeBook V line. First of all, remove the battery. 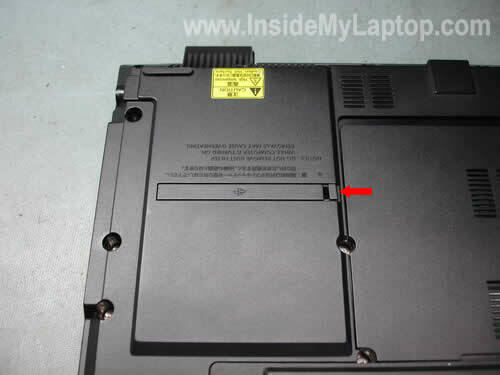 When the battery is installed, you cannot remove the hard drive cover. 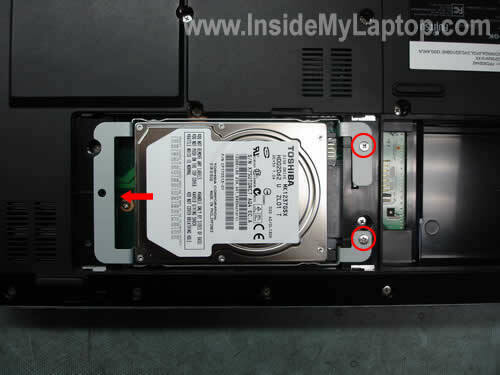 Remove one screw securing the hard drive cover. Slide the cover to the the right site and remove it. 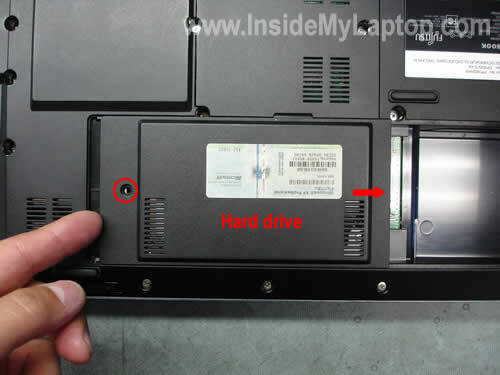 Remove two screws securing the hard drive caddy. Slide the whole assembly to the left and remove it. If you are replacing the hard drive, you’ll have to transfer caddy to the new drive. 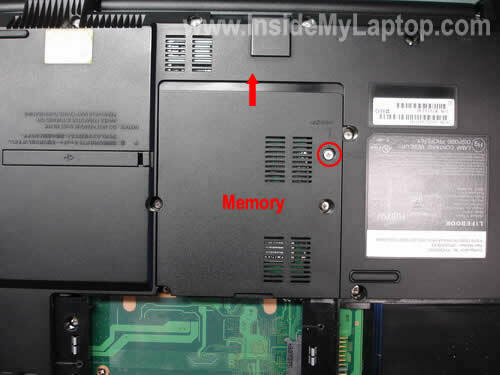 Now you can remove both memory modules. Spread latches on both side of the slot until the module pops up at a 30 degree angle. Remove the module by the edges, do not touch chips. 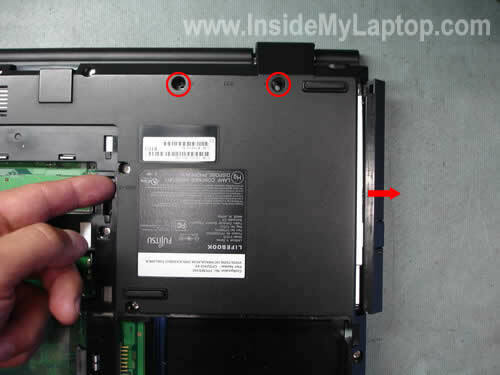 Remove two screws securing the CD/DVD drive. Push the CD/DVD drive out. Remove the drive. This cover gives you an easy access to the cooling module. 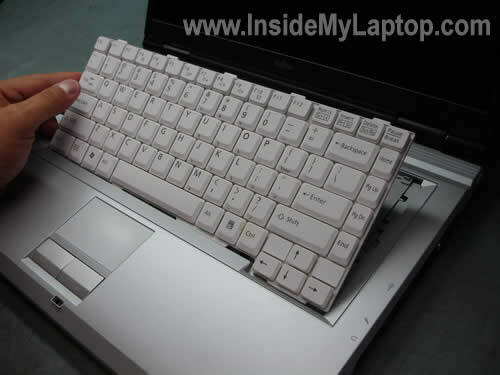 If your laptop runs hot and shuts down without any worning, probably it’s heat realated problem. Most likely the heat sink is clogged with dust and because of that the CPU overheats. Remove the cover. You can clean the cooling module with compressed air. 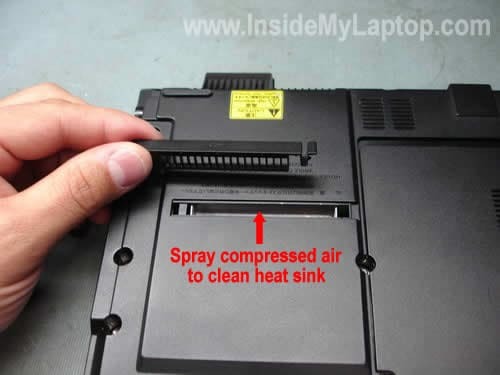 Spray air inside the opening until there is no dust inside the heat sink. That’s an easy way to fix the overheating problem. 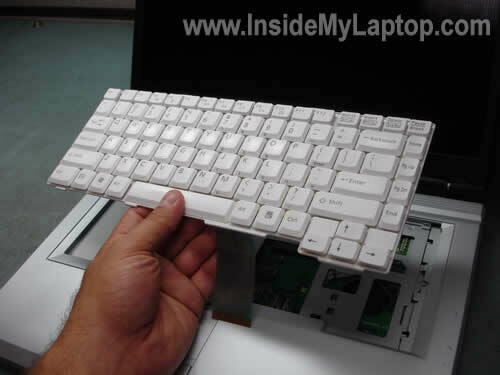 Now we are going to remove the keyboard. In order to remove and replace it you don’t have to go through steps 2-8. Remove the battery and then jump to the step 10. 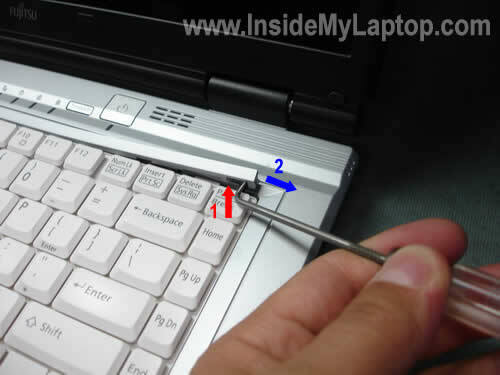 Start removing the keyboard bezel with a sharp object, you can use a small flathead screwdriver. Lift up the right side of the bezel (move 1) and then slide it to the right (move 2). Now lift up the keyboard. Place it upside down on the palm rest. Be careful, the it is still attached to the motherboard. 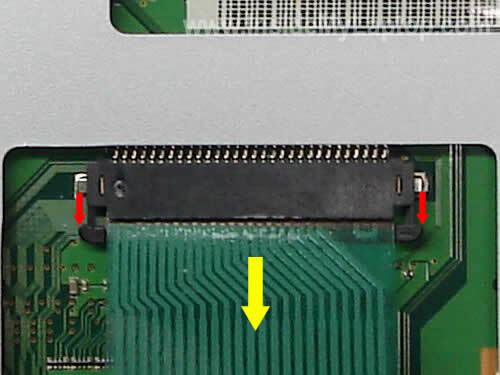 Unlock the cable connector on the motherboard as it shown on the picture above. WARNING! If you break the connector, you’ll have to replace the whole motherboard. Hi there, my V1010 screen goes blank intermittently (as in the backlight as i can see the faint graphics on the screen), i reckon it’s to do with the sensor/switch that turns on/off the backlight of the screen when it’s closed/open. The reason is that, when it goes dark, i just close and open the screen and it lights up again, might be a loose connection due to wear and tear over the years. i NEED 1 OR TWO REPLACEMENT BATTERIES FOR MY FUTJITSU V1010. ANY IDEAS WHERE TO PURCHASE THEM? I’m trying to see where the Atheros wireless modem is located? There shouldn’t be any problem unless the server is too buisy. Refresh the web browser. 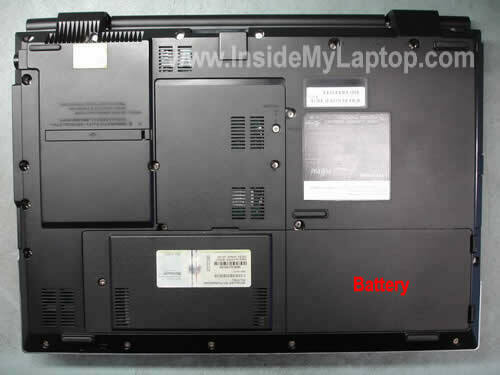 How to Repair faulty LCD on my Fujitsu Lifebook Laptop computer Model A1130. 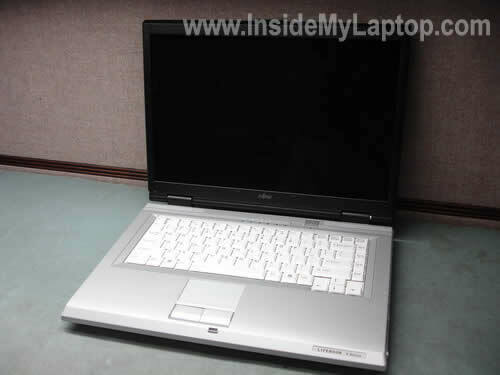 I have a very old Fujitsu laptop, Model N3530, with 2gb memory and a new 250gb ssd, running XP. I’d like to update to Windows 7 (I know you’re probably thinking ‘WHY”, just buy a new laptop, but it’s a really great laptop and fast eventhough its a relic). Is this even possible?